Every once in a while I come across a product that kind of rocks my world. Sometimes it’s an unexpected potion that gives me a lift but usually it’s a simple and familiar every-day product that gets a “new and improved” twist. I try it, I like it, then BOOM! My world is rocked. It’s that simple, and after all, I’m just a simple man with a dream. HA! 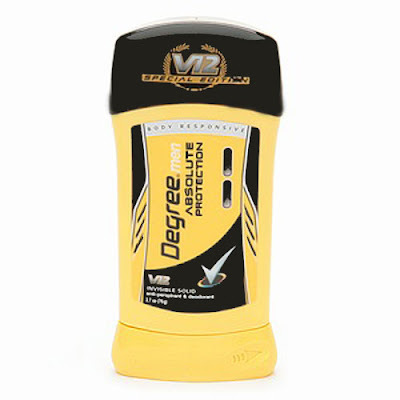 My latest rocker is Degree V12 Absolute Protection Anti-perspirant and Deodorant. I’ve always known Degree as the antiperspirant that cranks into full gear when you start to sweat. Degree V12 is designed specifically to respond to increases in adrenaline and provide superior protection when you need it most — at the gym, at the office or in the driver’s seat of a sports car. I’ve worked some intense cardio sessions while using Degree V12 and the only part of my t-shirt that remained dry was the underarm. It also has one of the nicer deodorant scents that I’ve smelled. The scent is super clean without being overpowering — it releases 1.4 million ARMOR-TECH fragrance molecules with every use to help curb arm sweat and odor. A definite winner. Degree has joined forces with NASCAR and Dale Earnhardt Jr. to launch Degree V12 in the form of an online racing game. The game is totally fun and brings the excitement of NASCAR racing to the computer screen. Dale Earnhardt Jr. and Brad Keselowski do the voiceovers for the game and will guide you through the race. It’s very cool.